The Flow Remedies crystal essences are created in Vlissingen, on the south-west coast of the Netherlands. It all started with 20 essences in late 2005 and has continued to grow from there. It’s 2017 now, and we’re approaching 200 essences in total, even more if we include the ones we’re developing and testing right now. They are created with loving attention, the energy from the sun and moon, and, in my opinion, quite a bit of help from above in the form of intuition, inspiration, energy and all kinds of synchronicities. The essences are mainly crystal essences, with the occasional flower essence, colour or angel energy added to a combination or spray. All essences and sprays are created and bottled in-house, and they are stored and sold in Miron violet glass, a special kind of glass that helps preserve energy and quality. Essences have no physical active component, they contain an energy pattern that is stored in a carrier, brandy in this case. The energy pattern is the spirit or energy of the crystals they were made with that was captured in water and then preserved. You can use essences to balance your emotions and your energy system and to help remove blocked energy. The vibration of the energy pattern influences the blocks and lessens them, helping you regain your emotional and energetic balance. And the more balanced you are, the better you feel and the more resilient you will be mentally and emotionally. Simply put: you will be able to handle more, and handle it better. 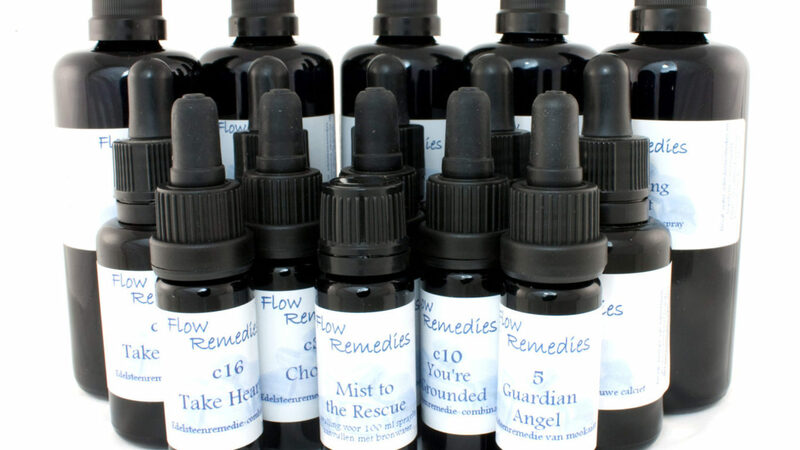 You can use the Flow Remedies essences for emotional and energetic balance, for clearing up specific issues, or for personal growth, and you can use them either by themselves or in combination with another form of therapy or healing. It goes without saying that it’s important to consult a healthcare professional or other qualified practitioner if you have health issues, for while the essences can help support professional treatments on an emotional and energetic level, they are never a substitute for them. If you’d like some tips on how to use and select essences, take a look at this page. Depending on what you want to use the essences for, and where you are in your growth process, you can venture out on your own, or ask a friend or therapist to coach you. Flow Remedies essences are available in the online store, which has its own secure domain over at www.justflow.nl. Clicking on the link will take you to the English storefront. If you’d like to know more about Miron violet glass, the information page for that is here. Miron violet glass is also sold in our online store. The background info section will provide you with some more in-depth information if you are new to essences.